Julie Sandman is a certified interior designer in the state of Kentucky who brings 30 years of design experience to her clients. Please click on the small photos above to enlarge, and see more photos on the portfolio page. J ulie Sandman is a certified interior designer in the state of Kentucky who brings 30 years of design experience to her clients. Julie takes pride in establishing close relationships with her clients, helping them convert their need and dreams into reality. She has extensive experience collaborating with builders, architects and specialty contractors in managing projects from concept to completion, while always being committed to customer satisfaction. Julie has a broad range of experience ranging from high-end residential, builder spec homes, medical/dental offices and church design. In order to stay current with the ever-changing design world, Julie expands her knowledge and experience by completing a minimum of 12 hours of continuing education each year. A Louisville native, Julie began her design career with Zriny Designs (5 years). 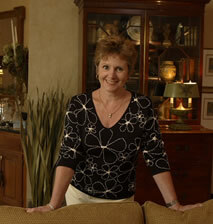 She established Julie Sandman Interiors in 1982. In 2016 AND 2017, Julie Sandman Interiors was ranked #3 of Louisville certified/registered interior designers by Louisville's Business First magazine! "Julie decorated my house a few years ago. My friends are still commenting on how wonderful it looks. She was the first decorator to get my style. Thank you." "Professional, personalized service at a reasonable price! Julie designs to your style with up to date materials. She is a pleasure to work with." "Julie was wonderful to work with. She came into a home that had been decorated 30 years before and updated the decor while being sensitive to the fact we were planning on downsizing in the near future. Julie really listened to our likes and updated the look of our home, using most of our original large pieces. Her sense of color is outstanding. Installation of carpet, painting, window treatments and bedspreads were all done and delivered when promised." "Julie Sandman Interiors and staff did an exemplary job for me. I am so grateful for Julie's guidance, great taste and vision in decorating my home. She was always responsive to requests and flexible in scheduling to best meet my needs. Working with her was a pleasure! Every contracted professional or vendor I dealt with through her sang her praises. She is so respected for her professional and gracious demeanor that I received excellent service from everyone involved." "I have worked with Julie for years, most recently when my husband and I built a new home. As always, the experience was wonderful. Julie is thorough and professional with exceptional style and design skills, and a keen attention to detail. She takes pains to learn the homeowners' style preferences and create a space that reflects them. Julie is also sensitive to cost, delivering the style we want within our budget. Our new home is even more fabulous than we hoped. I would highly recommend Julie Sandman without hesitation." 5-star review on houzz.com from Fran B. With respect to her long time client Fran B., whose testimonial is above, Julie notes, "I've had the honor of working for Fran on 4 homes in Louisville, as well as a condo in Chicago, and each experience has been great! As I've gotten to know Fran better I've been better able to instill her personal style into her spaces. Looking forward to the next one!" "When I moved to Louisville, Julie was my first friend! We built a house and she was the best help from top to bottom - from drawer pulls to wallpaper to furniture. She introduced me to all the right places to help complete our new home. I was planning with her long distance and she made it so easy." "Wonderful professional to work with. Enjoyed that she let me take the lead and make my own decisions with guidance from her." "Julie Sandman Interiors did an exemplary job for me. I am so grateful for Julie's guidance, great taste & vision in decorating my home. She was always responsive to requests & flexible in scheduling to best meet my needs. Working with her was a pleasure! Every contracted professional or vendor I dealt with through her sang her praises." "I have worked with Julie on several occasions and she is always professional and totally prepared. She's a great listener and has an eye for detail, making it possible to move forward quickly. When I built a large new home, she helped me with the entire house. Years later, I still love what we did together. Now we are redoing a guest house and again she's making me happy." "Julie is outstanding! She listens more than she talks and gets things done as timely as possible. She is sensitive to personal style, wants, needs and varying price points. I recommend her for anyone with any project no matter how big or small. She treats every project at every price point with the same professionalism and respect. She has helped me with many projects over many years in two different homes. With her help my homes reflect my personal style and taste mixed into the current up to date styles and trends." "Julie Sandman Interiors did an exemplary job for me. I am so grateful for Julie's guidance, great taste and vision in decorating my home. She was always responsive to requests and flexible in scheduling to best meet my needs. Working with her was a pleasure! Every contracted professional or vendor I dealt with through her sang her praises. She is so respected for her professional and gracious demeanor, that I received excellent service from everyone involved." "For many years now Julie Sandman has successfully helped me with multiple projects in my house. To name a few, from helping me pick paint colors, carpets, draperies, chandeliers, bathroom and kitchen counter tops, and flooring to referring me to the best builders, carpenters, electricians and many other skilled, reliable professionals. She has continuously been pleasant, punctual, affordable and reliable. Even if I do not have a real project in the making, I feel comfortable calling Julie because she is always readily available to lend me creative advice and provide me with helpful options. I would highly recommend her to anyone who needs help or advice with their home." "Julie Sandman has been our go to professional for interior design, window treatments, and all our home finishes for many years. 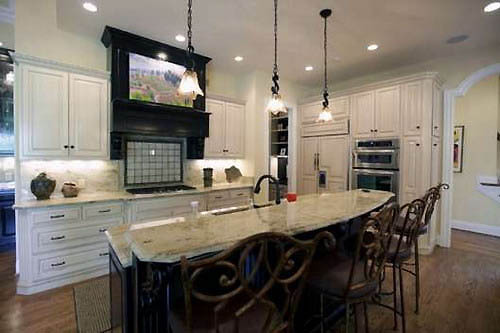 Her expertise, creativity and organization skills make Julie Sandman Interiors the premier design firm in our area. She is a delight to work with". "Julie was easy to work with and always prompt and conscious of deadlines. I felt like she listened to what I wanted, and delivered a home that fit my vision and taste". "There are may things I really liked about working with Julie. Most importantly she listened to our desires so the outcome was a look that relected our lifestyles and tastes. She's easy to work with, pleasant and patient. She knows good people to help with the various services. And I was continually amazed with her 'eye'! She could immediately tell what would work and what wouldn't and could quickly put together many options for me to choose from".